We’d love your help. Let us know what’s wrong with this preview of The Crayon Man by Natascha Biebow. What child doesn't love to hold a crayon in their hands? But children didn't always have such magical boxes of crayons. Before Edwin Binney set out to change things, children couldn't really even draw in color. Here’s the true story of an inventor who so loved nature’s vibrant colors that he found a way to bring the outside world to children – in a bright green box for only What child doesn't love to hold a crayon in their hands? But children didn't always have such magical boxes of crayons. Before Edwin Binney set out to change things, children couldn't really even draw in color. To ask other readers questions about The Crayon Man, please sign up. What age of children shall read this book to understand it ? First sentence: Once there was a man who saw color everywhere. Premise/plot: The Crayon Man is a picture book biography of Edward Binney the creator of crayons. My thoughts: I loved, loved, loved this one. The narrative is well written. It's packed with information--which I loved. Plenty of information is included within the sidebars. But at its heart it remains an entertaining story. Edwin invented a new kind of inexpensive slate pencil that wrote very smoothly--it was gray. Children loved it! He invented a kind of chalk that wasn't dusty and didn't crumble--it was white. Teachers loved it! He invented a wax crayon that would write on wood and paper packaging. It was really, really black. People loved it. Edwin's wife was a former school teacher. She told him that children needed better, cheaper crayons. So he set about inventing something that would work. In a large tub at the mill, Edwin's team measured out the ingredients: melted wax, clay to thicken, something for texture, colored powders, each in just the right amount every time to make...a top secret formula. Slowly, carefully, stirring by hand, they poured the special formula into thin, crayon-shaped molds, smaller than any other inventors' just the right size for children's hands. The mixture cooled and hardened. Edwin watched, and Edwin waited. Edward Binney and his staff get the prize for giving children crayons, safer than the older, not useful or safe, artist's crayons. In those early days, paper was too expensive so children wrote with a gray pencil, on slate tablets. They worked but rubbed off too easily. Natascha Biebow tells the story starting with the 'need' for crayons of the colors of the world so children could draw them. Binney's wife knew about this. She was a teacher. And Biebow takes the reader through pages of persisten Edward Binney and his staff get the prize for giving children crayons, safer than the older, not useful or safe, artist's crayons. In those early days, paper was too expensive so children wrote with a gray pencil, on slate tablets. They worked but rubbed off too easily. Natascha Biebow tells the story starting with the 'need' for crayons of the colors of the world so children could draw them. Binney's wife knew about this. She was a teacher. And Biebow takes the reader through pages of persistence, experimentation, and finally, the celebrated result, CRAYOLA CRAYONS! Within the book, boldface type shows up in the names of the colors throughout the story. Steven Salerno's illustrations themselves are filled with action, from a "lightbulb' above Binney's head to him and his staff working hard to find just the right mix of wax, clay, and pigment - whew! Each night they headed home covered with color! They wanted to get this invention just right, and they finally did. Imagine you love nature and all the colors of the world. Now imagine you're an inventor but all day long you're surrounded by black: black dust, black tar, black ink.... What do you do? Well, if your name is Edwin Binney you invent crayons! This colorful, engaging book describes the history and the chemistry which led to the development of Crayola crayons while also being accessible to young readers. A 2-page photo spread showing modern day crayon manufacturing at the Crayola factory, a brief bio Imagine you love nature and all the colors of the world. Now imagine you're an inventor but all day long you're surrounded by black: black dust, black tar, black ink.... What do you do? Well, if your name is Edwin Binney you invent crayons! This colorful, engaging book describes the history and the chemistry which led to the development of Crayola crayons while also being accessible to young readers. A 2-page photo spread showing modern day crayon manufacturing at the Crayola factory, a brief biopic of Edwin Binney, and a selected bibliography complete this picture book. How many times have you held a crayon in your hand without thinking too much about it? Or maybe you’ve had some wonderings.... it’s the origin story you didn’t know you were waiting for! Fun story and fantastic backmatter! 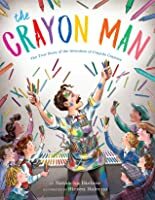 The Crayon Man: The True Story of the Invention of Crayola Crayons is a children's picture book written by Natascha Biebow and illustrated by Steven Salerno. It chronicles the story of Edwin Binney – the creator of crayons. Edwin Binney was an American entrepreneur and inventor, who created the first dustless white chalk, and along with his cousin C. Harold Smith was the founder of Handicrafts Company Binney and Smith, which marketed his invention of the Crayola crayon. Biebow's text is rather sim The Crayon Man: The True Story of the Invention of Crayola Crayons is a children's picture book written by Natascha Biebow and illustrated by Steven Salerno. It chronicles the story of Edwin Binney – the creator of crayons. Biebow's text is rather simplistic, straightforward, and informative. It detailed how Edwin Binney saw the world in color and how he wanted children to experience the same feeling and set out to eventually invent the crayon. There are also additional factoids in small boxes littered throughout the book. Salerno's illustrations are drawn rather well and rather colorful, which is apropos to a book about the crayon inventor and a children's book. The premise of the book is rather straightforward. Edwin Binney saw the world in color, but worked in a world of blacks and grays. He would eventually invent chalk, which was beloved and eventually crayons, which children loved worldwide. A great biography aimed towards kids to see how crayons were invented. Hint his name was Edwin Binney and he was an inventor and it all started with the invention of a gray slate pencil and dustless and not crumbly chalk. The story is informative and the pictures are beautiful! Focusing on the man who invented crayons and what it took. Wax + clay + pigment. And points out that the timing of cheap paper becoming available helped crayons catch on.